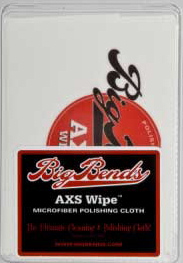 The AXS Wipe and AXS Mit are both cut from the same amazing microfiber cloth. They remove dust, dirt and grime like magic. Both have over 70,000 fibers per inch; each fiber is 100 times smaller than human hair, 30 times finer than cotton, and 10 times finer than silk. These cloths can be washed and reused hundreds of times and are the ultimate cleaning and polishing accessory!